September 11th, 2012. Ring… ring… The bell has sounded and Greek School is back in session. 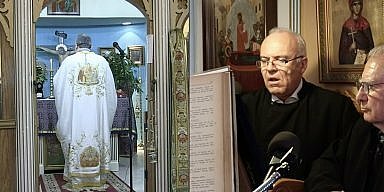 In our on going SPECIAL COVERAGE of the areas Greek Schools, Cosmos Philly visited St. Demetrios Greek School in Upper Darby this past Tuesday. Known for there long and rigorous program, the kids at St. Demetrios, Father Nektarios and Principal Androulla Kasapis talked with us about the school year. 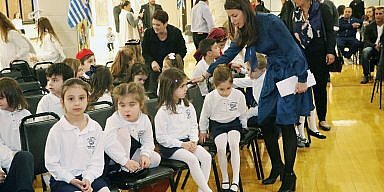 St. Demetrios classes are 3 hours long and meet twice a week, making it the longest running Greek School classes held in the Delaware Valley for studying Greek. Many of the students here take and pass a Greek government course that credits them with Greek standards achieved in Greece. Cosmos Philly Congratulates St. Demetrios Greek School on it’s standards to preserve Greek language.